The foliage is ablaze with color! This year's Autumn event is a classic collection event - no pins to click! For the duration of the event, you'll find the seasonal section of your shop stocked with mesmerizing Fall decorations - shrubs and trees in a rainbow of warm Autumn colors, and special seasonal vendors for your zoo. 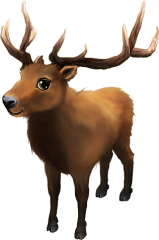 Each fall decoration you place on your zoo will give you points in the form of Colorful Leaves.Collecting enough Colorful Leaves before the event ends on September 14th at 11:59am CEST will allow you to earn exciting prizes, including a brand new animal - the Elk! Find out more in the forums or head on over to the game to see for yourself!